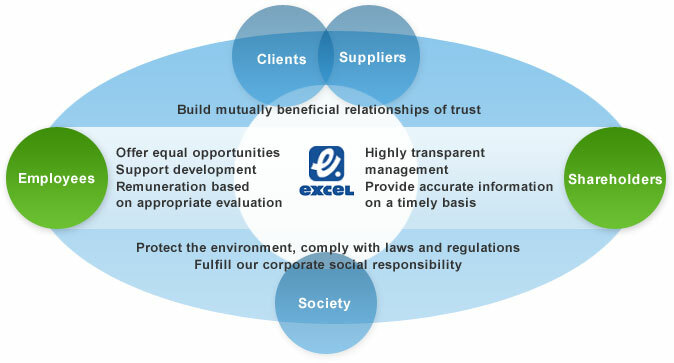 Corporate Philosophy | Corporate Information | Excel Co., Ltd.
With the understanding that enterprises are public organs, we will provide satisfaction to all customers, suppliers, employees, society, and shareholders through continual corporate growth. We will contribute to development of society through harmonization between advancement in electronics and improvement in lifestyle culture. We aim to pursue mutual prosperity and build trustful relationship for customers and suppliers. We will provide employees with fair opportunities, support their growth, and evaluate them properly, and treat them in accordance with results of such evaluation. We will fulfill our social responsibility as a social member, including environmental conservation and legal compliance. We will perform highly transparent management for shareholders and promptly provide them with accurate information. We will continue positive challenge for innovations with pioneer spirit. We will constantly improve operations and strive to enhance productivity. We will act in a free, open, and fresh manner. We will act fairly in compliance with laws and rules. We will act in a responsible manner on our own initiative with a sense of involvement. We will value fairness and dignity with awareness as a member of society. We will care for customers at all times and quickly respond to them. Copyright(c) 2013 Excel Co.,ltd. All rights reserved.